Meeting of the Red Army soldier by the civilian population of the liberated city of Vyazma. The city was occupied by the Germans October 7, 1941. Over the next year the Red Army has repeatedly tried to dislodge the Germans from the city, but the bloody battles were fruitless. 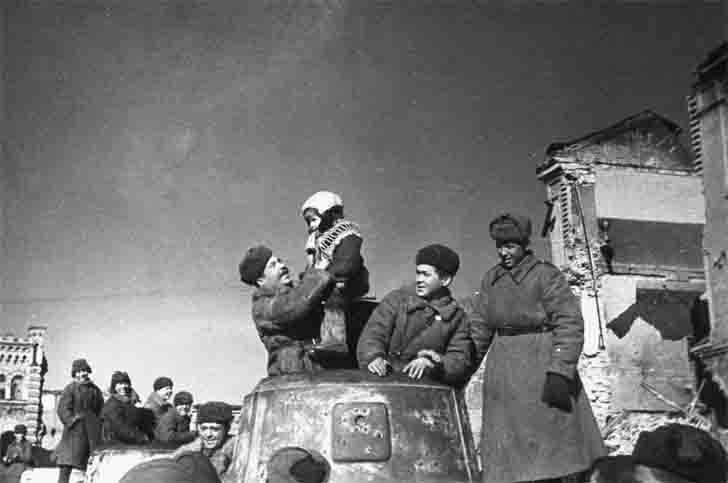 March 12, 1943 the troops of the Western Front during the Rzhev-Vyazma operation the city was liberated by the 5th and 33th armies. The photo shows the BA-10 armored cars of the Soviet manufacture.